F- Fun Career Fairs – Check out which Career Fairs AgCareers.com will be attending in the future! G – Gifted generations – HR professionals are now tasked with motivating and incentivizing employees spreading across five different generations! 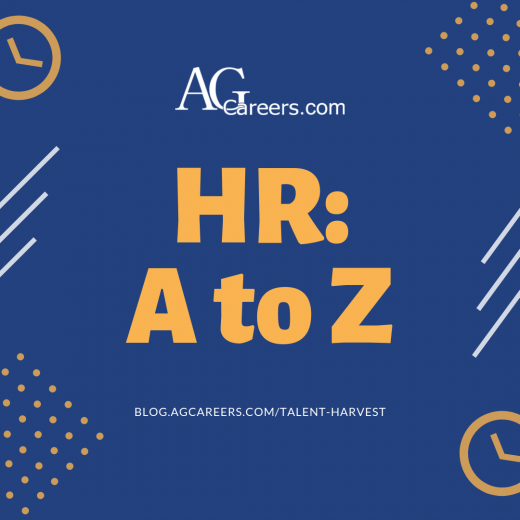 H – HR Review – AgCareeers.com will soon release the twelfth edition of the Agribusiness HR Review! I – Inquisitive Interns – Did you know AgCareers.com not only posts internship positions, but also conducts an Internship Benchmark Survey? J – Job Seeker mobile app! The AgCareers.com job seeker mobile app provides free access to search thousands of active jobs within agriculture and food. K – Keen KPI’s – Key Performance Indicators help human resources professionals measure how effectively goals are being accomplished. L –Leadership Coaching for New Managers – Being a new manager has its own set of challenges. Luckily AgCareers.com offers a webinar to help facilitate a smooth transition. M – Meaningful Market Research – Look no further for information about HR trends, workplace diversity, candidate experience and many more! AgCareers.com conducts a number of surveys throughout the year to keep you informed! N – New Networks – No HR professional should have to “go it alone”. There is no better way to network and learn about HR trends than AgCareers.com’s Ag& HR Roundtable. Click here to learn more. O – Outstanding Objectives – What is your human resources department working towards? P – Post a Resume – whether you are looking for talent or looking for a job, we’ve got you covered. Q – Quality information- Take a look at AgCareers.com’s Infographics, which contain quality information about various positions within the ag industry. R – Reliable Resume Database – If you’re looking to fill a job, check out our resume database to find qualified candidates. S – Savvy Skills – AgCareers.com will be hosting a webinar titled, Bridging the Skilled Trade & 2 Year Recruiting Conundrum. T – Targeted Training – Make the most of training delivered to employees. Don’t waste working time on lackluster training programs! Check out webinars and workshops offered by AgCareers.com. U – University Partners- A Agcarees.com program intended to showcase and share information about educational opportunities in agriculture. V – Valiant Veterans – Ag Warriors is a program that assists military men and women in the search of their career within the agriculture and food industries. W – Wonderful Work-life Balance – workplace flexibility can provide employees with necessary schedule and environment to maintain a balance between home and work. X- X’tra, X’tra read all about it! If you aren’t already subscribed, check out the AgCareers.com Newsletter Archives for a plethora of human resources related articles and subscribe as well. Y- Yearly Evaluations – Are you checking in with your employees? Having regular meetings to talk about performance is never a bad idea. Z – Zealous Employees- Conducting regular employee engagement surveys can help pin-point the climate of the organization. Have you seen our similar blog post “Recruiting: A to Z”?